His dog was dying. But they could spend one last day together. Drawing on personal experiences, stories from fellow pet owners, and philosophical reflections, GOING HOME provides guidance and support for those in mourning. By allowing ourselves to grieve honestly and openly, he posits, we can in time celebrate the dogs, cats, and other creatures that have so enriched us. 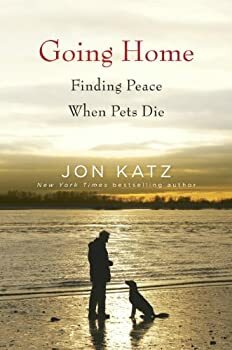 With great compassion, Katz compels us to consider if we gave our pets good lives, if we were their advocates in times of need, and if we used our best judgments in the end. In dealing with these issues, we can alleviate guilt, let go, and help others who are undergoing similar passages. Full of empathy, insight, and sage advice, Going Home is an invaluable guide and touchstone for anyone who has lost a pet. Jon Katz honors the animals that have graced our lives and reveals their truly timeless gifts: unwavering companionship and undying love. Below is an excerpt from the book, Going Home: Finding Peace When Pets Die. It is possible to take something beautiful and lasting out of the heart-wrenching experience of seeing the animal you love move inexorably toward death. Nobody can take the grief away, nor should anyone try, but our love for animals is nothing but a gift, and it keeps on giving, even when they go home. A man named Harry, an Iraq war veteran and tennis coach from Minnesota, hit upon a simple and profound idea to transform this otherwise sad experience into a blessed one. It was a gray morning when the vet told Harry that his dog Duke’s heart was failing and that it wouldn’t be long before he died. Harry was not surprised, but still, the news depressed him. Listening to the vet, Harry later told me, he’d gotten an idea, one he thought would pay tribute to his life with Duke and give him something to feel besides sadness and loss. “Tomorrow, I’m going to give you a Perfect Day,” he said quietly to Duke as they left the vet’s office. He would take the day off from work and create a sweet memory with his dog. It would be a special day, filled with all the things Duke loved most, as close to perfect as Harry could make it. He would take his Canon PowerShot along to capture some images of the day, to preserve the memories. Duke was a border collie/shepherd mix. He had always been a lively, energetic dog and would herd anything that moved. Walks, work, food, Frisbees, red balls—these were the things Duke loved, along with chasing balloons and popping them. Harry went shopping for supplies, and when he came back Duke was napping on his dog bed. He went over, lay down next to the dog, and hugged him. “Pal,” he whispered, “tomorrow is for you, your Perfect Day.” He was embarrassed to tell his wife, Debbie, about the plan, but she sensed what was going on and gave the two of them the space they needed. It was her belief that the dog, more than anything else, helped Harry heal from the trauma of Iraq. He couldn’t look at Duke without smiling, and when he had first come home, he hadn’t smiled too often. At eight the next morning, Harry got up. Duke was lying on his bed, which was next to Harry and Debbie’s. The dog rose a bit slowly, then followed Harry down the stairs and into the kitchen. Harry opened the refrigerator and took out a hamburger patty and two strips of bacon, cooked the night before. He put them on a plate and into the microwave. Duke was riveted. When the plate came out—Harry touched it to make sure it was warm but not hot—he dumped the meat into Duke’s bowl, along with his heart pills. It was as if Duke couldn’t believe his eyes. He was almost never given people food. Looking up at Harry, as if asking permission, he waited until Harry nodded and said, “OK, boy,” before inhaling the food. A feeling of sadness came over Harry as he thought about how Duke would soon be gone. He wandered into the living room and lay down on the couch. Duke came over and curled up next to him. Harry began to sob, softly, then more deeply and loudly; Duke gently licked his face. After a few minutes, Harry rose to get dressed. Although he worried about straining the dog’s heart, he let Duke follow him up the stairs. On this day, Duke could do anything he wanted. No corrections. He sat on the bedroom floor and watched Harry put his clothes on. When Harry said “Sneakers,” Duke labored to get up onto his feet, walked over to the closet, and brought Harry his white running shoes. Harry had enjoyed training his dog to bring him his sneakers, and Duke seemed to love it too. Harry went back downstairs, followed by Duke. He picked up a bag from the pantry and walked out into the yard. Inside the bag were two dozen high-bounce red balls. One at a time, he threw them and bounced them off the back fence. Duke tore after one gleefully, then another, catching some, narrowly missing others as they whizzed past his head. When Duke started to pant, Harry stopped. Next they went to the town pond. Harry sat by the water’s edge while Duke waded in, paddled around, swam back, shook himself off, then repeated the routine about a dozen times. Every few minutes Harry tossed the dog a liver treat. It practically rained the small and pungent treats. Once again, Duke looked as if he could hardly believe his good fortune. They came back to the house and napped. After lunch, Harry took Duke to the vast state park outside of town. He picked a flat, gentle trail, and the two of them walked a couple of miles. Eventually, they came to a stone abutment with a beautiful view. Harry walked over to the edge and sat down. Duke clambered out and curled up beside him. It was a gorgeous afternoon, and the wind ruffled the dog’s hair. Duke held his nose up to the wind, picking up the scents of the earth. God, I love this creature, Harry thought. I never feel this peaceful, this much at ease. It is something to remember, to honor. They sat together for nearly an hour, enjoying a bond of complete understanding and affection. If only the world could stay like this, Harry thought, this simple, this good. Harry knew that Duke was tired, so they took their time walking back, stopping frequently to rest. A few years earlier, Duke could have hiked all day, and sometimes they did that together. But not anymore. When they got home, Harry cooked Duke some prime sirloin, then chopped it up. The dog was beside himself, looking up at Harry as he ate, expecting the food to be taken away. That evening, Harry put one of his favorite Clint Eastwood movies into the DVD player and Duke hopped up onto the couch, put his head in Harry’s lap, and went to sleep. When the movie was over, Harry carried the dog up the stairs and laid him down on his bed. Several weeks after the Perfect Day, when Harry came home from work, Duke was not there by the door to greet him, and he knew he was gone. He went into the living room to find Duke dead. He knelt by his dog, closed his eyes, and said a prayer. Then he dug a deep hole in the backyard and buried Duke there, along with some bones, his collar, and some of his beloved red balls. Of all the photos Harry took on the Perfect Day, the one he loved the best was of Duke sitting out on the stone ledge in the state park, taking in the sights and smells. Now every morning before he goes to work, he flips open his cellphone and smiles at the picture of Duke, looking for all the world like a king surveying his territory. Harry passed on the idea of the Perfect Day to friends and other dog owners struggling to come to terms with their own pets’ failing health. Many have since shared with him the stories of their dog’s Perfect Day. It makes him happy to think about Duke’s legacy—all those Perfect Days for all those other great dogs leaving our world behind. Watch the trailer for the book. All of the photos in this trailer were sent in by Jon’s fans. Posted on December 30, 2011, in Uncategorized and tagged animals, books, companions, death, grief, jon katz, pets, review. Bookmark the permalink. Comments Off on Going Home: Finding Peace When Pets Die.